“find us for some in the construction of grottoes, which they illuminated at night with a piece of candle, generally on the first of August. Spence (2012?) in his Highways to Canterbury notes that in Whitstable, St James’s day celebrations were taking place on Grince Green where there was on old church believed to be dedicated to the saint in the mid 19th century and that Whitstable children built the shell grottos. The custom appears to have died out in around the 1960s, but in the last few years a revival at Whitstable and Margate. 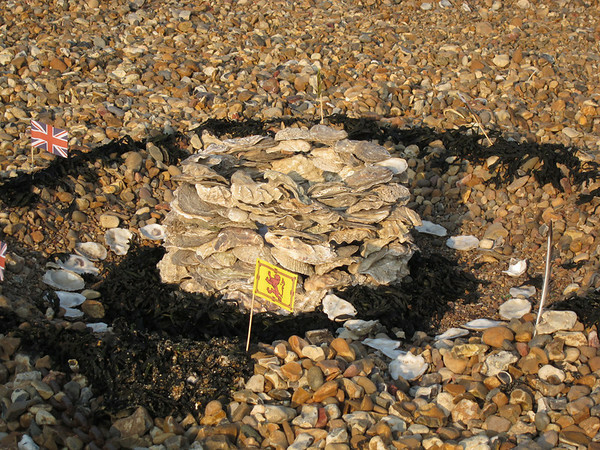 At Margate’s shell grotto in the last few years, children have been encouraged to make them with shell panels. In Whitstable the Oyster festival has understandably revived it since1988 persuading local people and especially children to make shell grottoes on the Reeves beach where the blessing of the sea also takes place. Here large numbers of children and adults make their grottoes with a candle inside, some even being adorned with flags. The whole beach becoming magical as the evening progresses…and it’s great to see such a simple but beautiful custom being revived.